After catching word of it just now, I thought I would make a kind of time-line about the posts the Facebook page Sweet Cakes By Melissa has made that related specifically to their court case (whereas there are numerous posts in between with baked-goods photos). This is just a list, not an editorial comment about them. All of the information below is, or was, already publicly available as of April 25, 2015. (Parenthetical remarks) are by me, just as observations. Just an update for you all. Still waiting for BOLI to respond. Will update as soon as we hear from them. “I’ve always found it interesting that the ones who do this kind of thing maybe aren’t thinking of the word’s definition. Especially the intolerant part…..I personally don’t have any problem with others who disagree with me. Everyone has their own opinion. I don’t understand why people can’t disagree and still be kind and loving to one another. Seems pretty simple to me. “The gofundme account that was set up to help our family was shut down by the administrators of gofundme because they claimed it was raising money for an illegal purpose. We have told gofundme that the money is simply going to be used to help our family, and there is no legitimate breach of their terms and conditions. We are working to get the account reinstated. Robert Downey Jr, thinking he was being interviewed to promote his upcoming Avengers film, was interviewed by a famous UK journalist named Krishnan Guru-Murthy but RDJ promptly walked out after the subject of the interview dwelt on RDJ’s personal life instead of the film. A lot of people seem to be blaming Krishnan Guru-Murthy for asking much to personal of questions, but really, that’s how Channel 4 content works. Interviews, especially by Krishnan Guru-Murthy, are with people who star or direct or sing, or whatever, in something recent, but are not being interviewed to promote the content they’re associated with — they’re being interviewed to investigate what makes them who they are as people, as individuals. However, Krishnan Guru-Murthy interviews are not, by nature commercials for the movie. It is an interview about who QT is and what his internal struggles or motivations are. That’s how a Krishnan Guru-Murthy interview on Channel 4 works. Channel 4 isn’t allowed to promote content like that in the first place. If you’re being interviewed on a food network, you’re going to get asked about food. If you’re being interviewed on a show about motorcycles, the topic of conversation will likely center on motorcycling. If you’re being interviewed by Krishnan Guru-Murthy on Channel 4, you’re going to get asked personal questions about your identity and by nature, the interview will split away from whatever you star in or are currently trying to promote. Krishnan Guru-Murthy himself is already fairly widely known for straying from the topic of promoting a star’s or author’s intention to promote something, and to address controversy. When Pharrell Williams, who at the time was promoting Blurred Lines, Krishnan Guru-Murthy focused on a perceived interpretation of controversial lyrics and PH’s motiviations as a person, rather than trying to promote the music. When he interviewed Samuel L. Jackson, he asked about who his characters are compared to who he is as a person on a deeper philosophical level. When Krishnan Guru-Murthy interviews Richard Ayoade, who is one of the stars of the British (original) version of The Office, who is promoting a book he wrote, the questions turn toward RA himself rather than the book. During the interview itself comes the realization that the interview itself is about him and not the book, and RA catches on and engages Krishnan Guru-Murthy in the process. RDJ, however, runs away. He should have known, in the first place, that the interview would be about himself instead of the movie. No, RDJ, Channel 4 interviews, especially conducted by Krishnan Guru-Murthy, are not, and haven’t been. You go to Krishnan Guru-Murthy to be asked those questions but RDJ’s assistants or own personal investigation into who is interviewing him ran up short on that detail. I recently posed the question to my FB newsfeed of whether the cat-traversing-stairs photo indicated he was traveling up or down, and got quite a varied response. Personally, I am on Team Up. Before I get to why, however, I want to make a few qualifying observations. The design of this staircase seems very unusual. What should be considered as evidence one way or the other, is overridden by this actual staircase. That is, we would have to eliminate possibilities that whoever built the stairs did so against more common design, or that the architect who designed them intentionally went against the common understanding of stair construction. We would have to assume, perhaps too broadly, that dozens of possible evidence-disqualifying traits of other stairs should be dismissed without knowing whether they should or shouldn’t be dismissed. The evidence is this staircase, only. This staircase is unique, as is the cat that is traversing it. Why are the bricks on the edges like that but not anywhere else? Why are there no handrails? There are lots of questions that need answers, really. Team Down: The edge of each stair has a lip, that is present in most stairs. The lip is raised and offers a shadow to indicate that it is extended away from the rest of the step, if the light source is from above. Stairs with a lip on the edge would be a tripping hazard. Team Up: The edge of each stair is a stair grip, which is raised higher than the rest of each step to offer a different texture for foot traffic to better grasp the step ledge for safer travel. Whether or not is a tripping hazard is irrelevant for this staircase. It could simply be a staircase that is tripped over a lot, or is rarely used because of the tripping hazard, and is too expensive or outside of the skillset for the homeowner to alter. Seems just fine for cats, however. Team Down: The posture of the cat suggests the cat is going down the stairs, since its tail is up for balance. Team Up: All you’ve done is assembled a few photos of cats with their tails in positions you’ve indicated. The same can be done in reverse. The question is whether this cat is using its tail for balance when going up, or using it for balance when going down, or if the photographer snapped the pic of the cat moving it from one position to the other, forward or backward. It would make better sense for the cat’s tail to be up than straight back hen ascending to offer counterbalance, than to be up when descending and causing too much of a forward imbalance (pardon the crude illustration). Team Down: The brick shapes along the wall that meet the stairs who have to be vertical if the cat were ascending, rather than horizontal as bricks are most often laid if the cat were descending. Team Up: The bricks we can see are too thick to be part of the wall and thus having a sensible reason to be laid obviously horizontal, because of the space between each brick is appx 1.5 bricks apart, not 1 or 2 bricks. Team Up: The area behind the cat from which it has come appears to be a solid wall, if the cat is going down. Why would a staircase lead immediately into a wall? Because it’s a floor, not a wall, and the cat is going up. The texture of the floor appears consistent with a surface perpendicular to the edge of the stair-wall. Team Down: It may just be the sky back there, or a wall that is further out of view without seeing the foot of the wall and we can only see the upper portion of the wall. What side are you on? If you have any additional theories, I’ll append them to the article here and create illustrations. It may be among my life’s work to reconcile the concept of evolution, which is true without any doubt in my mind, to the type of Christianity (from which I come and am surrounded by) that believes evolution to be patently false and bases their reasons directly from scripture. It is my intent to reconcile the two concurrent ideas into one unified idea, bridging the two so that one side can identify with the other, and the other can identify with the one. First and foremost, if you believe that evolution is false based on a reading from the text of scripture, then you must be reading a very different scripture than the one I see. I will not use a specific translation in order to bend my interpretation, nor will I make my assertions and proposals as if they were red-lettered. This is conjecture; an argument from within canon. In the way that iron sharpens iron, please first consider my proposals with as hard of a heart as you can muster. Then, consider it again in your idle thoughts when the heat generates shape. I came from a background of Christianity in my youth but not coming to a relationship with Christ until my early twenties. I had a rebellious period where the rules-system of Christianity did not make sense when compared to a so-called loving connection with God and I washed my hands of it at some point in high school until a college minister made the crucial connection between the two for me at which point an AH-HA! moment transpired and I became a resolute Jesus freak. Christianity, as it turns out, is, actually, highly compatible with the “but-this-but-this” type of thinking to which I had embraced as a rejection of Christianity, whereas the questioning elements had actually strengthened a foothold toward Christ rather than away. If you interested in this disconnect, I can elaborate elsewhere. This particular AH-HA! moment is the kind of event that could easily transpire between the evolutionary biologist and the creationist Christian, I think, that connects the two seemingly perpendicular lines of reason into a very interestingly parallel pattern. My interest in the parallels of Christianity and evolution came largely from two influences. The first way came as a result of my language study in university. I encountered the idea that a dictionary is not the end-all reference text for “prescriptive” correctness of usage, but that it is rather descriptive of English. That is, a dictionary is a tally of observations about how the ordinary person uses English out in the wild, and lists them in order of frequency. For instance, “go” in the dictionary is listed both as “to travel”, and “to fit” as in a square block may not “go” into the circle hole. If more people have been observed to use go when they intended to mean travel, then the travel definition is listed earlier in the entry. If less people had been observed to use go when they intended to mean to fit, then the fit definition would be listed later within the entry for go. The list of ways that “go” was used was not a limitation on the ways “go” was allowed to be used, but were merely the limited ways in which “go” had been observed by the publisher’s researchers. The publisher also generally has a sufficiency threshold, that limited which words (or which ways words were used) could enter the pages their dictionary — but exclusion did not mean therefore that it was an illegal or improper usage, since these were strictly observations. The second influence into converging evolution and creationist thinking was an article I read on the study of how behavior alters DNA over generations, in a newish branch of study into epigenetics. This line of thinking, to me, was as if scripture were leaping out and demanding to be recognized in modern science, in the sense that behavior (sin) was already known scripturally to be inheritable and would result in atypical circumstances within the lineage of the person who did it. In John 9 Christ’s disciples were traveling with him and they encountered a man who had been blind from birth. A brief conversation unfolded indicating that it was already well known and popularly-believed that blindness or other unfavorable atypical traits came about as a result of errancy of behavior within successive generations within a specific parent-offspring lineage. I then began to research into the possibility that scripture itself was not actually prescriptive, but rather descriptive in the scientific way. In science, generally, overwhelming amounts of data goes into the formation of a theory — it’s not merely a proposal that people believe, but is rather a pattern that can be observed by the general masses in analysis of this same large amount of data. Like a dictionary that observes statistically significant trends in how the masses use words, evolution is an idea held widely by a statistically significant number of people in response to a statistically significant pattern that emerges from a very large amount of data. It’s not a needle in a haystack, it’s the observation of the haystack. My proposal is that the bible canon is descriptive, rather than prescriptive. Scripture is a large amount of data, from which patterns can be observed and speculated about. I propose that the writers of the bible are their-age scientists writing papers describing, rather than prescribing, observations of their time. God, as they understood it, was the passage of time itself and that time itself were personified. Time, after all, I think scientists can easily agree without waxing too philosophical, was, is, and is to come. The phrase “was, is, and is to come” (Rev 1:8) itself describes time, and time is the crucial element of the observation of evolution. Creationist and evolutionists can likewise agree that beings are brought into existence by time (although much debate on how much). In Exodus 3, when Moses was first propositioned by God to free the enslaved Hebrews from Egypt, Moses asks God what named authority would God have Moses say that Moses comes as a representative of, as a way to credibly substantiate himself as someone representing God. God told him to say that Moses comes to free the Hebrews by the authority of the name “I Am”. “I Am” identifies in the present-tense, an idea which both modern science and creationist can agree always exists regardless of the relativity of who is experiencing it. Each person, everywhere, regardless of traveling at the speed of light, asleep, in an altered state of consciousness, or awake in the most scientifically observable form of it, does exist and experience the present tense, in the now. It is always now. Over the course of the passage of now, creationists and modern science can agree that what currently exists in the environment, by one way or another, is and formerly wasn’t, but that the environment was changed, in one way or another, alongside the presence of now, at the time of the changes. During the changes, the changing events were at some point “now” then, and the over the passage of time, or the progression of the presently-experienced moment of time was always in existence during all of the changes. If literal versions of the creation story are to be believed, then God instituted science since Adam was tasked in the Garden of Eden as noted in Genesis 2 with tending the garden. God also brought animals to Adam to view and name, and essentially “whatever Adam named them, that’s what its name was.” Giving animals names would require the differentiation between what is or isn’t an animal, and itself could be the foundation of science itself. Moses himself expressed scientific inquiry when encountering the bush that was not consumed, and is attributed as saying basically, “That’s weird,” and then going over to examine it. Flames he had encountered previously, and bushes he had encountered previously, but a flame that did not consume a bush and a bush that was not consumed by flame was an event sufficiently statistically significant that it warranted examination. I propose that all science is the differentiation between what is and what isn’t according to categories of being. Differentiation is not a callous observation necessarily, and two similar-looking things may not actually be the same thing, requiring a lot of study. I propose that Adam was the first scientist, who took observation of his environment, named elements within it in order to care for them better, noting relationships between one element and another such as the growth of plants in different types of soil as someone tasked with tending a garden might need to know. I propose also that those who are uninterested in new ideas, who fail to pursue new ways to categorize things and ideas, who refuse to engage in questioning their previous ideas and coming up with better ways to arrange those ideas in ways that make more sense with how things can now be observed in the light of new evidence, are those who depart from God’s original purposes for man, and who depart from the most fundamental aspects of science. Is the photo of Inola Oklahoma Tornadoes real? Nope. Here’s Why. 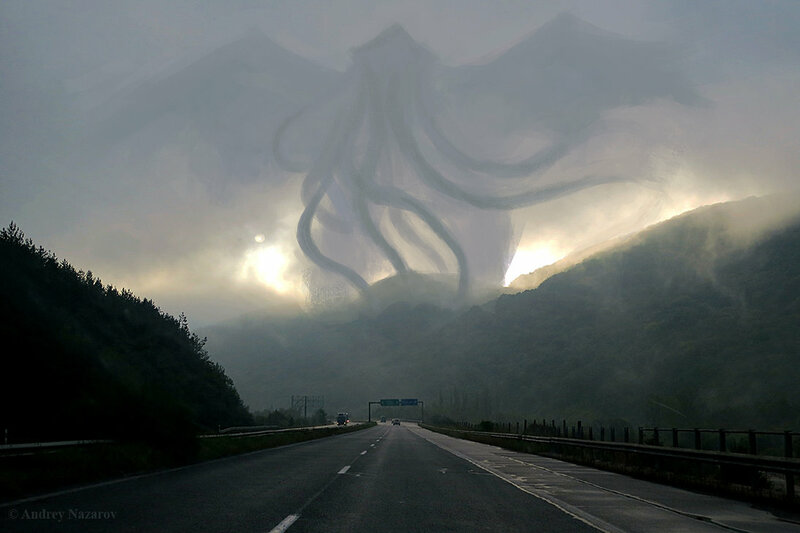 For some reason, someone who didn’t do their research, or a prankster perhaps, decided to post a digital artwork called “Cthulhu Rising” by artist DaShadeE from DeviantArt, as if it were a photograph of tornadoes in the distance on a road. The reason that it looks fake is because it is fake. Those are tentacles, not tornadoes.. and the bumps at the top are wings. And yet, the forwarding of this, as if it were an amazing storm system continues to get circulated. Also, Inola Oklahoma is flatland, not mountainous. The actual location, according to the artist, is a highway near Sophia Bulgaria (which is in Europe, not even in the US). The artist used a photograph of the roadway found on Google, and painted the Cthulhu above it. The artist has stated that it’s okay to share, but does not offer it commercially or sell it. This way of thinking is highly problematic because it manufactures the framework around which being angry seems reasonable, when instead the framework itself is the absurd part. Say for instance the CEO of a silverware company were to reveal plans for a new spoon design, and a journalist wishing to sell newspapers asked the question, “Yes-or-no, mister CEO, could your new spoon in fact, be used by bigots to torture and blind gays by scooping out their eyeballs?” The answer is that yes, it could technically, but is a really bizarre use for a spoon and goes beyond any rational thought for the actual intended use of spoons. Imagine if other journalists, who saw the kind of attention the spoon story was getting, also posed the question and got people on both sides into an uproar about whether spoon-scooping was even actually a real threat, and how someone could possibly “defend” bigots by trying to claim it’s just a spoon and therefore enabling bigots to continue with their gay-blinding campaign of terror. Does the company not have a concern for the well-being of gays? But really, it’s just a spoon. There is an important line of thinking that seems to be ignored in this discussion, and it involves a situation from the Christian text in the book of Acts (chapters 7 and 22) concerning the guilt in a three-party situation. The situation is someone who is being stoned to death, the person throwing the stones, and the person holding the coat of the person throwing the stones. Although the text does not suggest the guilt of the person holding the coat to be just as guilty of the stoning as the person throwing the stones, that type of relationship is very widespread. Being extremely careful to distance oneself from someone involved with what is believed to be a criminal act is important to those who have this belief. There is, therefore, rationale for the refusal to bake a cake for a gay wedding. Although reasoning against the refusal might be “well you’re not the one being married, you’re just baking a cake,” the act of baking the cake could be too much of a gray area to risk being accused in the final judgment as someone who holds the coat for someone engaging in homosexual favoritism, despite not intending to be. The accusation of being a coat-holder is worse in the mind of the religious person than being accused of discrimination, and the business owner would prefer to risk sounding like a bigot, if it meant being completely innocent of the charge against him of being a coat-holder. Recently, Indiana’s Governor, Mike Pence, found himself at the center of a firestorm associated with his signing of a so-called Religious Freedom Restoration Act (RFRA). This past week has seen Governor Pence attempting to defend, and ultimately, backpedal on the law. The backlash has led to a number of prominent voices speaking out against the enactment of this law and the hashtag, #BoycottIndiana trending on social media sites. The outcry has led Arkansas Governor, Asa Hutchinson to withhold his signature from a similarly-worded bill sent to him by his legislature. Governor Rick Snyder of Michigan has vowed to veto a similar bill if sent to him by the Michigan legislature. The Indiana legislature is currently scurrying to amend the Indiana RFRA at the behest of businesses and residents of the state.